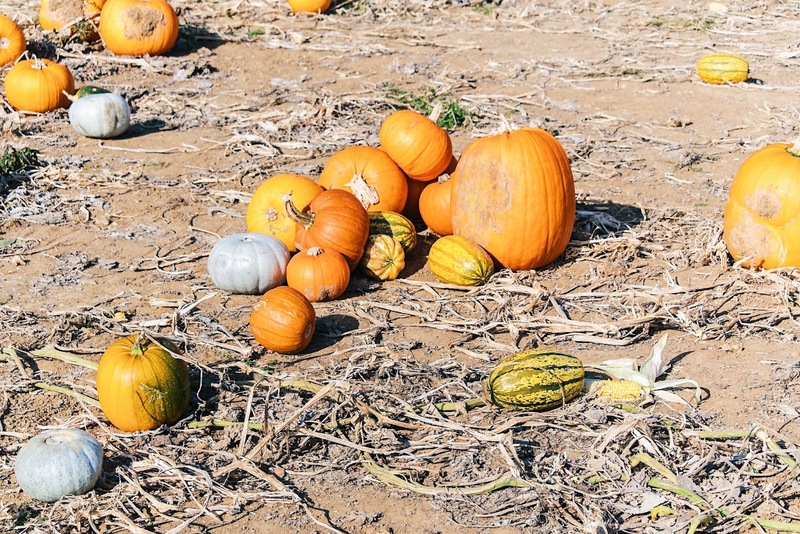 I know you're probably all sick off the pumpkin patch posts by now. 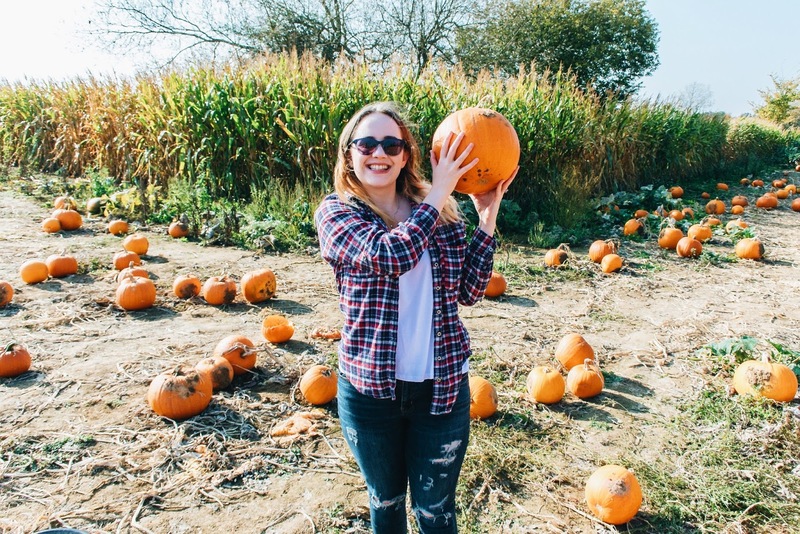 You can't scroll through social media without seeing someone looking triumphant while holding a pumpkin or a golden field of the orange fruits; but I don't care I'm posting about it anyway. As far as trends go, I think this is a great one. 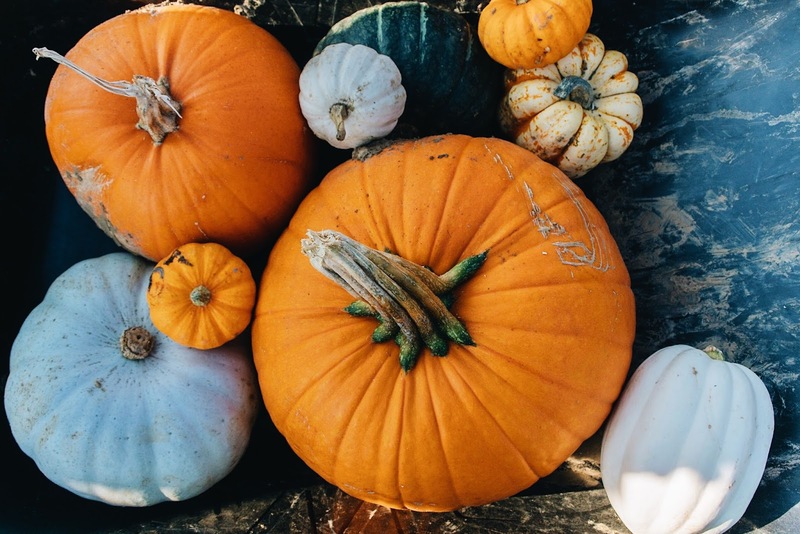 Sure the PSL hype is overdone, and it's very fashionable to love autumn and gush over the blankets, hot drinks and cosy interiors but I still consider picking a pumpkin to be a fairly new idea in the UK and one that has (rightly in my opinion) grown hugely popular this year. Anything that gets people out of the house, in to the fresh air experiencing nature and helping local suppliers is OK in my book, and seeing everyone's photos over the last month has really made me smile. Of course it helps that we've been blessed with some great weather this Autumn. 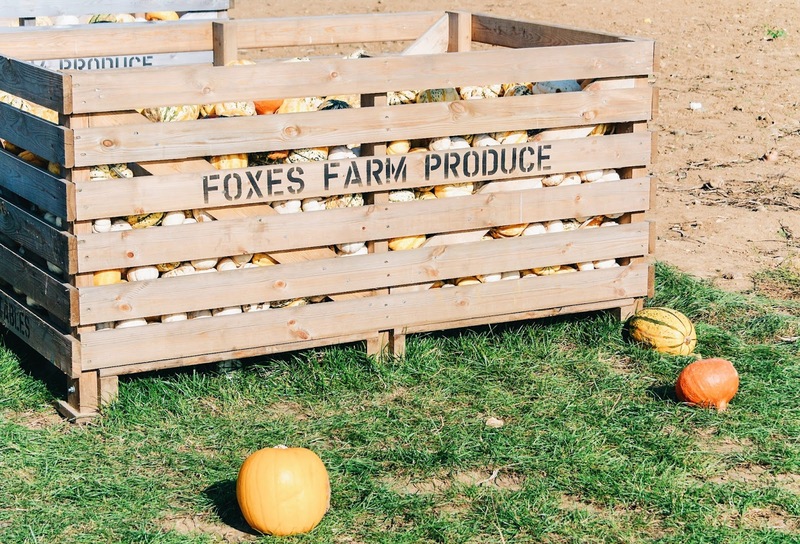 We'd originally planned to visit the Pumpkin Patch at Foxes Farm Produce at the beginning of the month, but due to other plans we didn't make it until a couple of weeks ago. As it happened we visited on what was probably the hottest day and the place was heaving (a massive difference to the somewhat empty car park when we first scouted it out). The patch is free entry (so bring the whole family, but no dogs) so we strolled in and set about finding a wheelbarrow and of course there were none to be seen as most were in the long queue to pay and leave! Luckily Harry accosted someone in the car park and we were all set to start picking our pumpkins. 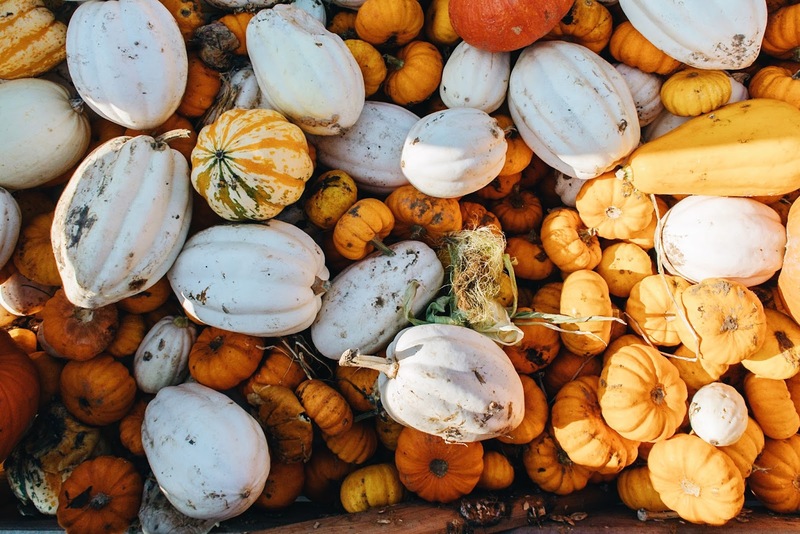 There were a number of varieties to choose from including munchkin, monster, crown prince (the whitish grey ones) and squash (the green ones) which were all scattered about the patch in piles, boxes and of course in the fields themselves. Pumpkins ranged from £1 to £8 which we though was pretty reasonable and lead to us filling our wheelbarrow with quite a few! Our main goal was to select one of each so I could create a display of them once we got home and of course it was Harry's job to pick up a big one! Did I mention how hot it was that day? I'd anticipated the typical British overcast weather and taking photos with orange hues against grey skies but there was barely a cloud to be seen. I honestly could've worn a pair of denim shorts instead of jeans with my checked shirt (I was going for an Autumnal look, can you tell?) and in hindsight I probably should've, it was boiling strolling around the patch in direct sunlight! Much better than the consistant rain that plagued our trip up to Norwich for some shopping the week before, although I was a tad disappointed not to get a little muddy. Muddy boots and dirty jeans are the sign of a proper day out aren't they? 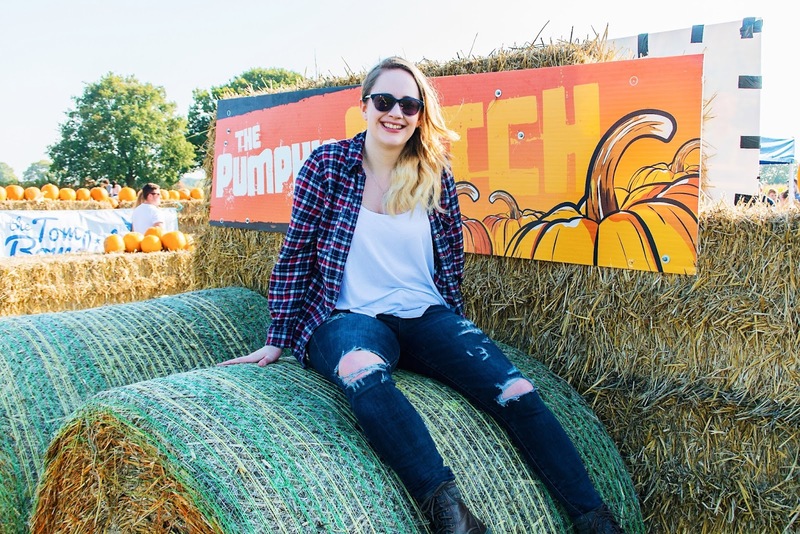 As well as the pumpkins the owners have also set up little activities and selfie spots throughout the patch like this bundle of hay bales for climbing on. If you've got kids I bet you could really tire them out here and obviously it's great for photos. 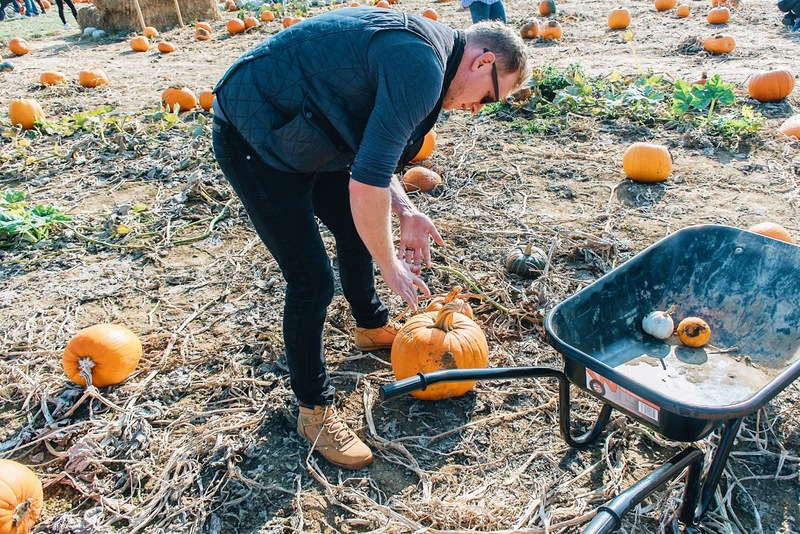 There were a number of parents with little-uns in tow being carted around in the wheelbarrows or sat on top of piles of pumpkins for cuteness overload. 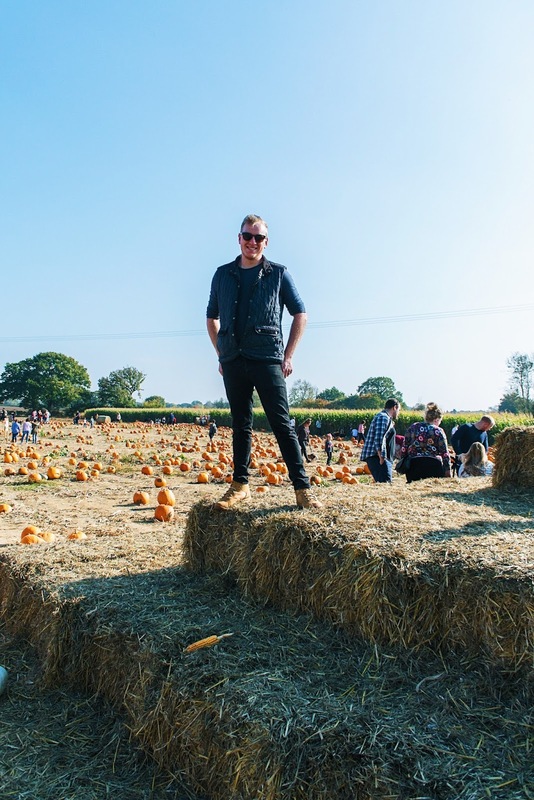 If you're a parent you might like to read my friend Sarah's account of her day at the Pumpkin Patch too with little Oliver looking like he's having the time of his life! 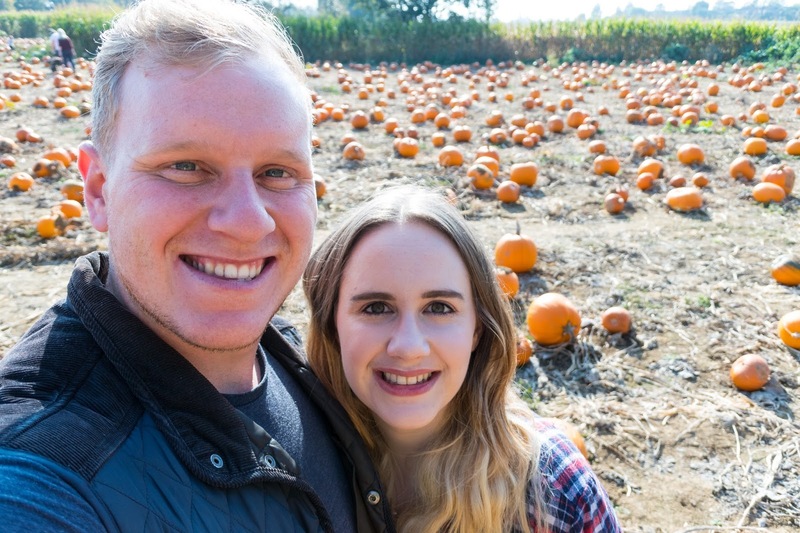 If I ever decide to have kids I'd even be tempted to do some meticulous planning in order to do a cliché pregnancy announcement with a pumpkin! 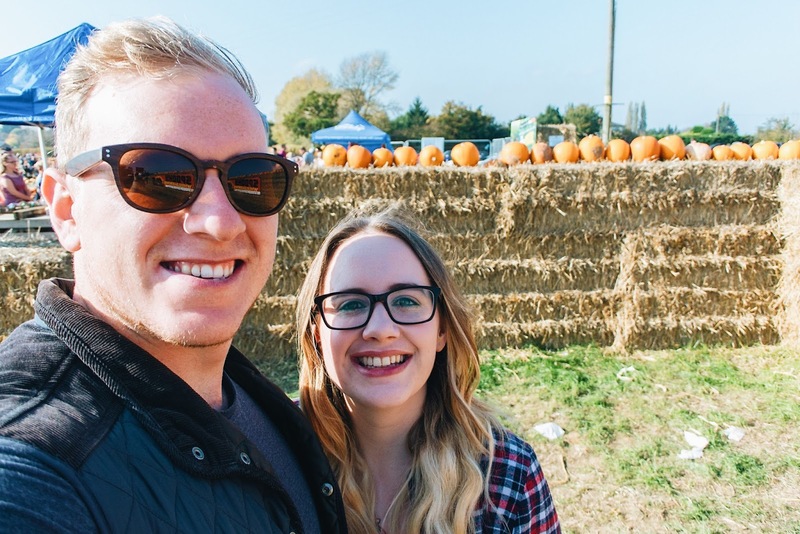 Once we'd picked up enough pumpkins (and taken enough photos...) it was time to get in line to pay. Although it looked long it moved quickly and our haul was tallied up to a grand total of £25. It was a bit more than we'd planned to spend as I'll admit once we had our wheelbarrow we got a bit carried away and felt the need to fill it but we were very happy with our hoard. Having moved into our new flat this year I've really wanted to decorate it properly not just for Christmas but for the Autumn season too. I think we're really behind the US on this front (they seem to go all out!) 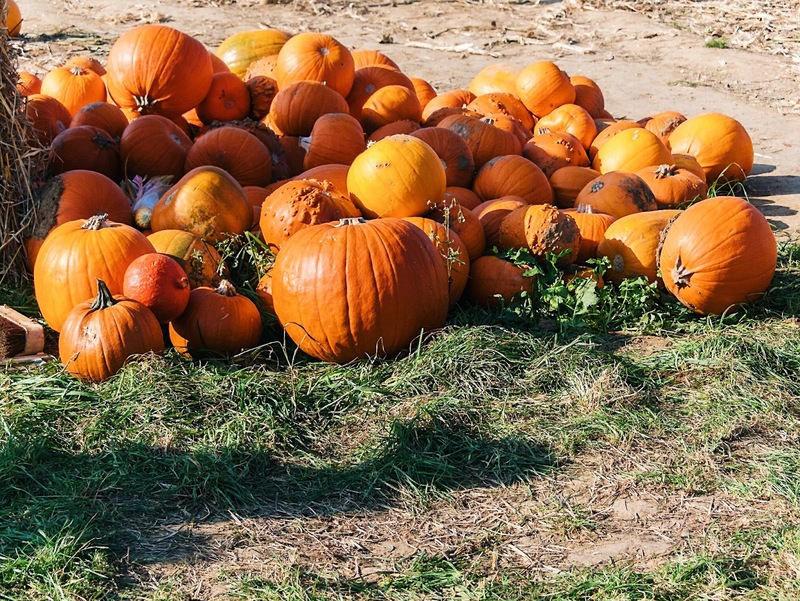 but I love the idea of bringing those beautiful colours inside and for me that starts with a big display of pumpkins! 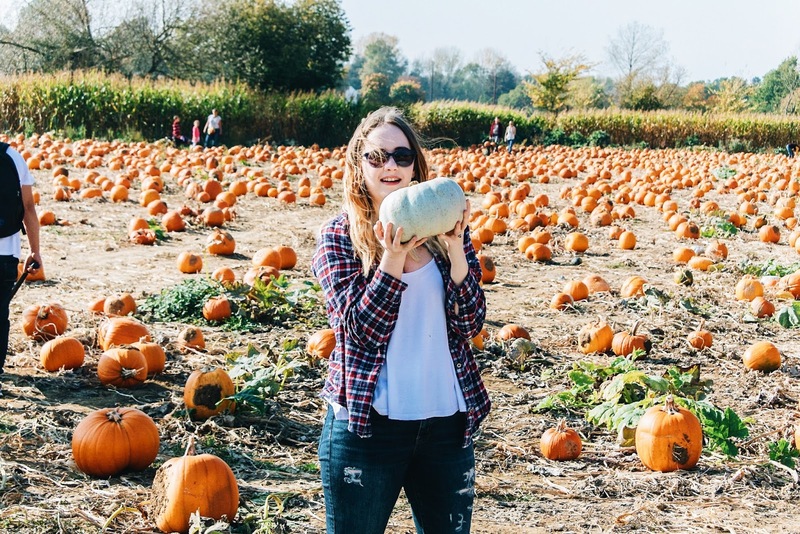 If you want to visit a pumpkin patch DO IT NOW as I know this one is closing after this weekend!